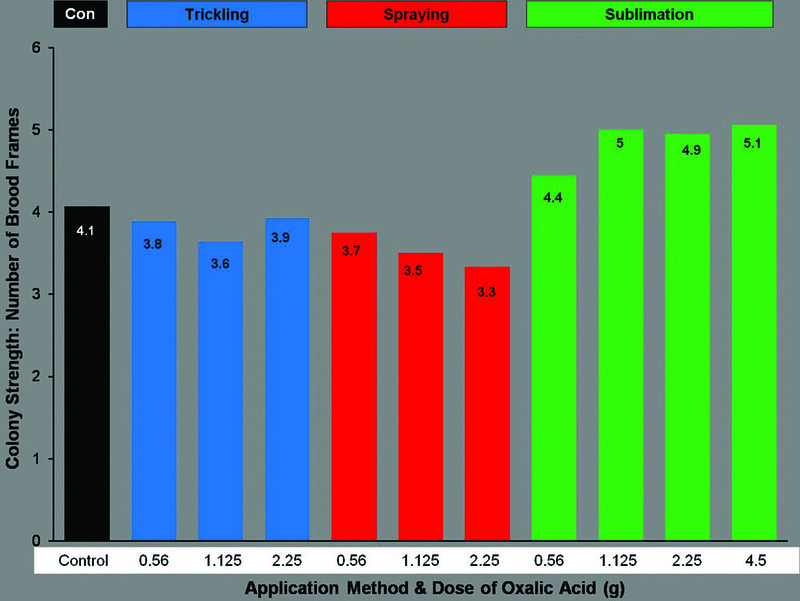 Oxalic Acid Treatment Methods. 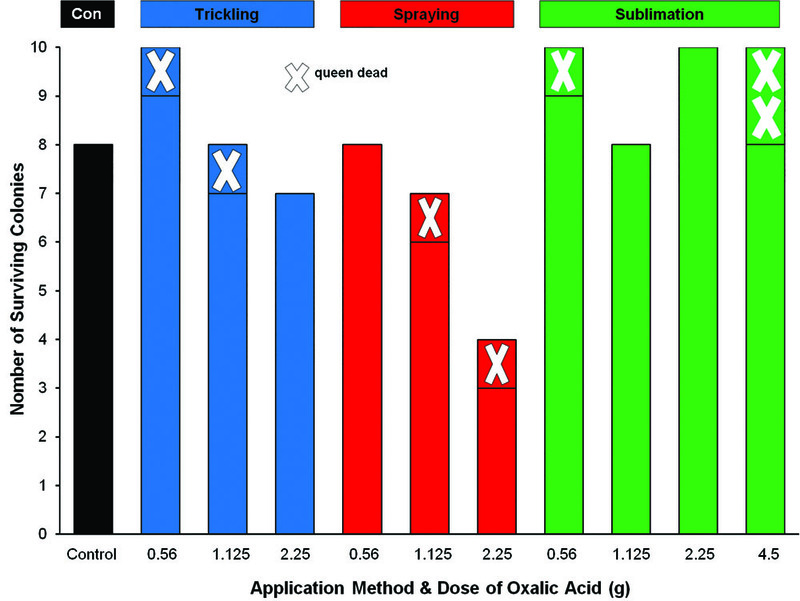 Top left and right – Trickling/dribbling and spraying methods, which use oxalic acid dissolved in a solution made using equal weights of sugar and water (e.g., 1 kg sugar to 1 liter water). Bottom left and right – Sublimation method, which uses a heated tool to vaporize oxalic acid crystals; photo to right shows application in progress, with hive entrance temporarily sealed using foam; photo to left shows oxalic acid fumes for illustration purposes only, as when correctly applied the fumes are contained within the hive. LASI research shows that of the three application methods used by beekeepers (trickling, spraying, sublimation) to control Varroa with oxalic acid, sublimation is the best in all respects. Sublimation is effective at lower doses, causes no harm to the bees, and results in colonies with more brood in Spring. Spraying significantly reduced colony survival. Application of 2.25g oxalic acid via sublimation to broodless hives in Winter killed 97% of the Varroa. Pests and diseases are a challenge to all beekeepers. One of the most serious is Varroa, the mite Varroa destructor, which originates from East Asia and is now found in all continents except Australia. Varroa was first detected in the USA in 1987 and is now found throughout North America. Varroa mites harm colonies directly, through the harm they do to pupal worker bees in sealed cells where the female mites lay their eggs, and where the mother mite and her offspring feed on the blood of the pupa. Worker bees parasitized in this way as pupae have reduced lifespan. However, the greatest harm is caused by Varroa spreading virus diseases, such as deformed wing virus. Colonies with relatively low numbers of Varroa can die if virus is also present, especially in Winter. For many years beekeepers could easily control Varroa with Apistan strips, which slowly release a synthetic chemical (fluvalinate) that is highly toxic to Varroa. However, resistance has evolved. In a recent test we did at LASI, we found that Apistan treatment killed only about half the Varroa in a colony. When Apistan was first introduced, and Varroa were non-resistant, the kill was nearly 100%. LASI research on Varroa control falls within our wider project, the Sussex Plan for Honey Bee Health and Well Being. The Sussex Plan focuses on two of the major challenges faced by honey bees and beekeepers: 1) Controlling pests and diseases; 2) Improving the bee food supply. 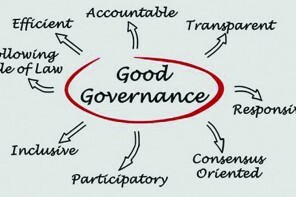 In the Sussex Plan we have been trying to carry out research with clear practical benefits. Before starting we talked to beekeepers. It was clear that they considered Varroa to be a major problem, and this matched our understanding and experience as scientists. Oxalic acid has been used to control Varroa for several decades and is known to be effective. So why was further research needed? The reason is that the previous research was incomplete. In particular, different application methods and doses had not been compared side by side to determine how effective they were at killing Varroa, and the effects they had on the bees. In addition, previous research had usually determined the numbers of mites killed rather than the proportion killed. We treated 100 hives with oxalic acid on 12 January 2013. A further 10 were untreated controls, making 110 hives in total. The hives were in 10 apiaries in Sussex, southern England, 11 per apiary. The hives were all in a single Commercial box (11 frames, volume 56 litres, about the size of two medium-depth Langstroth boxes), with a wooden bottom board with mesh floor, inner cover and telescopic outer cover, and were similar to the hives being overwintered by beekeepers in terms of management and numbers of bees. Hives had approximately five to 10 thousand workers. The hives did not have any capped brood when treated. This is important. Varroa can occur in two locations in a hive: 1) in brood cells, where the adult female mites lay their eggs and the young mites develop by feeding on the blood of the pupa; 2) phoretic, clinging to the body of an adult bee. Oxalic acid only kills the phoretic mites. In December and early January, when we did our study, 90% of the hives were naturally broodless. All the hives had been checked a few weeks before applying oxalic acid, and any brood was scraped out with a honey uncapping fork. Care was taken to minimise any disturbance to the bees, and without breaking the cluster by shaking bees off the frames as is usually done during a hive inspection in warm weather. The hives were also checked one day before each of the two samples of bees were collected to confirm that there was no capped brood. As a result, we could be sure that all Varroa were phoretic. Our application of oxalic acid (technically, oxalic acid dihydrate) followed methods already being used by beekeepers. This was because our aim was not to develop new methods, but to compare existing methods. In the trickling/dribbling and spraying methods, we applied 50 ml of sugar solution (1 kg sugar dissolved in 1 litre of water) with oxalic acid, made 12-18 hours previously, to each colony. In the dribbling method, the lid of the hive is removed and the solution is poured onto the top bars and gaps between the top bars where the bees were clustered, although there was never a tight cluster. In the spraying method, the frames are briefly removed from the hive and the bees sprayed with the solution. The sublimation/vaporisation method uses oxalic acid crystals. These were placed into the small cup at the end of the electrically-heated applicator, which was inserted into the centre of the hive below the frames. The heat causes the crystals to sublimate. That is, to turn directly from solid to gas. We used a Varrox® M3080 sublimator powered by a 12 volt lead acid battery. The doses followed existing methods. In all three methods we used doses of 0.56, 1.125, and 2.25 grams per hive. For sublimation we also used a dose of 4.45 grams. In total, there were 10 treatment groups and one control group. To eliminate any bias due to possible apiary effects, there was one hive per group in each of the 10 apiaries. The Winter weather was quite cold for England, maximum 5°C, on the day of oxalic acid application with an average maximum of 3°C over the following 10 days. It is recommended to apply oxalic acid at temperatures of 4-16°C. To determine Varroa mortality we took two samples of worker bees (mean = 267 bees per sample) from each colony. The first was taken just before oxalic acid treatment and the second 10 days later, when the mortality caused by the oxalic acid was over but before any capped brood was present. The samples were frozen and analysed later. The dead bees were placed into a double-mesh honey strainer. A jet of warm water from a hose nozzle was used to wash the Varroa off the bees. The Varroa passed through the first mesh and were trapped in the second, finer, mesh. We had previously checked this method, examining washed bees under a microscope, and had found that it extracted all the Varroa. We then counted the Varroa and bees from each sample. If, for example, the first sample had 10 mites per 100 bees and the second had 0.5 mites per 100 bees, then the mortality was (10 – 0.5)/10 = 0.95 = 95%. 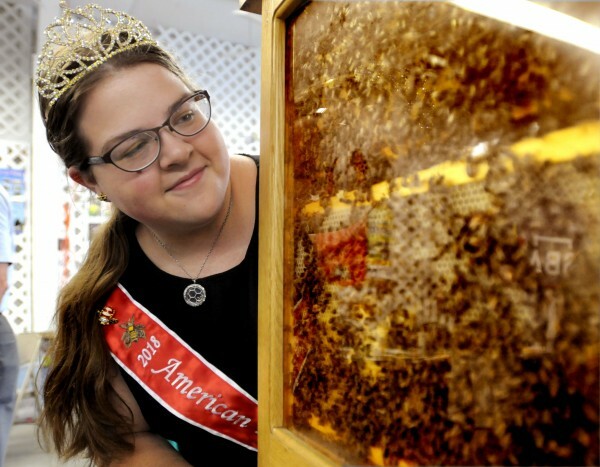 We also monitored the Fall of honey bees and mites for eight days before and 10 days after oxalic acid application, the survival and strength of colonies in Spring (four months after application), and if they had a queen. In the samples of bees collected immediately before the first oxalic acid treatment, the average level of Varroa was 9.8 per 100 bees, range two to 29, across the 110 hives. This is quite a high level and meant that we had plenty of Varroa to study, and to ensure adequate data for statistical analyses. Figure 1. Varroa mortality as determined by extracting phoretic mites from samples of worker bees taken immediately before and 10 days after oxalic acid treatment. Figures 1-4 are based on those from Toufailia et al. 2015. Journal of Apicultural Research. Vol 54(2), are copyright of the International Bee Research Association, and are reproduced by permission of the editors of the Journal of Apicultural Research. The original article is available open access at http://dx.doi.org/10.1080/00218839.2015.1106777. Figure 1 show that all methods gave high Varroa mortality at one or more of the higher doses. However, sublimation was more effective at lower doses. Sublimation was effective at all 4 doses used (0.56, 1.125, 2.25, 4.5g), trickling only at 2.25g, and spraying at 1.125 and 2.25g. How LASI Counts Phoretic Varroa On Worker Bees. 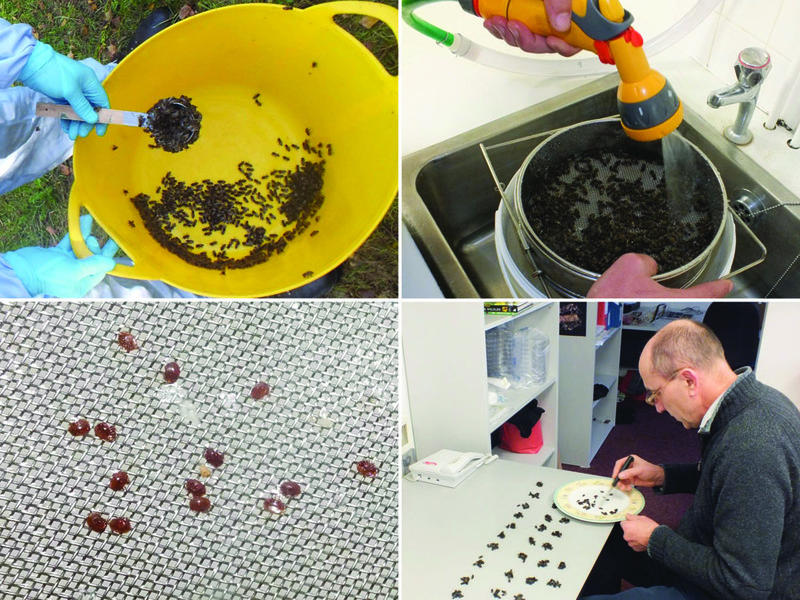 Top left – Worker bees are shaken into a gardening tub, and a sample is taken with a home-made scoop that will hold 250-300 when full. The bees in the scoop are then put into a zip-loc bag and frozen. Great care is taken not to take the queen. Samples are taken from queenless hives, in December or early January, so that all Varroa are phoretic. We always take bees from the center frames. Top right – Varroa are washed off the bees using a jet of water a double-mesh honey strainer. Lower left – Varroa pass through the first mesh but are trapped by the second, finer, mesh, where they are counted. Bottom right – After Varroa extraction, the bees in the sample are counted to determine the number. The number of bees falling onto the bottom board and into the dead bee trap did not increase after application for sublimation, but did increase for trickling and spraying (Figure 2). In particular, spraying with the highest dose, 2.25g per hive, resulted in a 10-fold increase in the number of dead bees per day. However, as the hives contained five to 10 thousand bees, even this method killed only 1-2% of the bees at or soon after application. Figure 2. Ratio of the average numbers of dead bees in each treatment group in the dead bee trap and bottom board combined, for the 10 days after treatment divided by the eight days before treatment. Bees were counted every two days. Figure 3 shows the number of hives out of 10 that survived until 3 May 2013, and if they were queenright. Of the 10 untreated control hives, eight (80%) had survived. Of the hives treated with oxalic acid, survival was: sublimation, 38/40 = 95%; trickling, 25/30 = 83%; spraying, 19/30, 63%. Sublimation gave the highest survival, and was significantly better than spraying. Of the 10 hives treated with the highest dose of oxalic acid by spraying, 2.25g, only 4/10 survived. Figure 3. Colony survival 111 days after oxalic acid treatment, on May 3, 2013. Colonies marked X were alive but queenless. There were 10 queenright colonies in each group at the time of treatment. The surviving control colonies had an average of 4.1 frames with brood (counting 0.5 per side with brood present) (Figure 4). This was slightly higher than in hives treated with oxalic acid via trickling (3.6-3.9) or spraying (3.3-3.7). However, the hives treated via sublimation had significantly more brood (4.4-5.0 frames), and was an average of 21% more than the control hives for the three highest doses (1.125, 2.25, 4.5 g). Figure 4. Colony strength 111 days after oxalic acid treatment, on May 3, 2013, quantified as the average number of frames (0.5 per side) with either sealed oropen brood in the surviving queenright colonies. Based on the results above from year one, we concluded that we could advise beekeepers that the best method was to treat hives with 2.25g of oxalic acid via sublimation. Although 1.125g via sublimation also gave high Varroa mortality, the highest dose, 4.45g, did not cause any harm to the bees or colonies. Therefore, it seemed reasonable to recommend the middle dose to allow a margin for error, for example in case a colony had more or less bees than average and so received a larger or smaller dose per bee. However, we first wanted to double check our results. Therefore, in mid-December 2013 we treated 89 broodless hives with 2.25g of oxalic acid via sublimation, using the same methods as before. The average varroa level per hive was 14.5 per 100 bees. Most hives, 87 (98%), survived until spring. Varroa mortality was 97.6%. This convinced us that we could recommend 2.25g via sublimation, and be confident that this dose would kill most of the Varroa without harming the colony. Sublimation Equipment. Top left – Varrox sublimator, 12 volts and 150 watts. Lower left – Close up of the heated cup at the end of the sublimator into which the oxalic acid crystals are placed. Top right – Lead-acid battery, 115 amp hours, capable of powering the sublimator for approximately nine hours. Lower right – Half teaspoon measures are cheap to buy and are a convenient way of dispensing oxalic acid crystals for sublimation as half a teaspoon, 2.5ml, of oxalic acid crystals is almost exactly 2.25g. Our conclusions are simple. The sublimation method is the best in all respects. It results in Varroa mortality that is as high as the trickling and spraying methods, but at lower oxalic acid doses. It gives the highest colony survival four months later, in Spring, and results in colonies with significantly more brood than untreated control colonies or colonies treated by trickling or spraying. Based on these results we recommend that beekeepers do not use the trickling or spraying methods. In particular, the spraying method harms colonies and results in significantly lower colony survival over the next four months compared to sublimation. 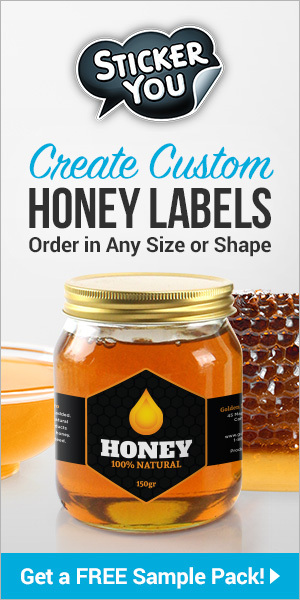 A bonus of the sublimation method is that the hive does not need to be opened for application, and it is generally the quickest method, taking about three minutes per hive. Most of the time is taken waiting for all the oxalic acid to sublimate, which takes a few minutes for 2.25g. Our results showed that colonies treated via sublimation had more brood in Spring than control colonies or colonies treated via trickling or spraying. We do not know why. However, a likely reason is that sublimation-treated colonies were healthier than control colonies, as most of the Varroa had been killed, and so built up faster. There was quite a high level of Varroa before treatment, 9.8 per 100 bees on average, and these would not have been killed in the control hives. Although trickling and spraying also kill Varroa, the harm they do could have cancelled out the benefit of killing the Varroa. Oxalic acid treatment via sublimation requires the beekeeper to buy or borrow an applicator. Most are heated electrically and need a 12 volt supply. 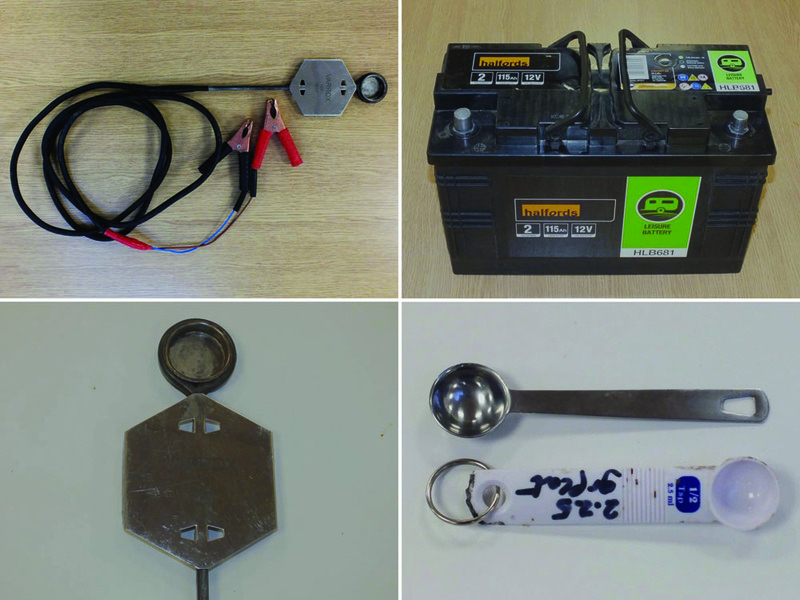 We used a 12 volt 115 amp hour lead-acid “leisure” battery, of the type used in a caravan and effectively the same as a normal car or truck battery. The Varrox® M3080 sublimator we used was rated at 150 watts, meaning that it draws a current of 150/12 = 12.5 amps. A fully charged 115 amp hour battery would be able to power the applicator for 115/12.5 = 9.2 hours. At three minutes per hive this would be enough to treat up to (60/3) x 9.2 = 184 hives. In other words, a large battery would be enough for a full day’s work treating hives. Although we did not try it, a petrol generator could also be used. However, it would seem to be less convenient than a battery and the noise and vibration might annoy the bees. Oxalic acid is a natural chemical, and is found in honey and in many vegetables. 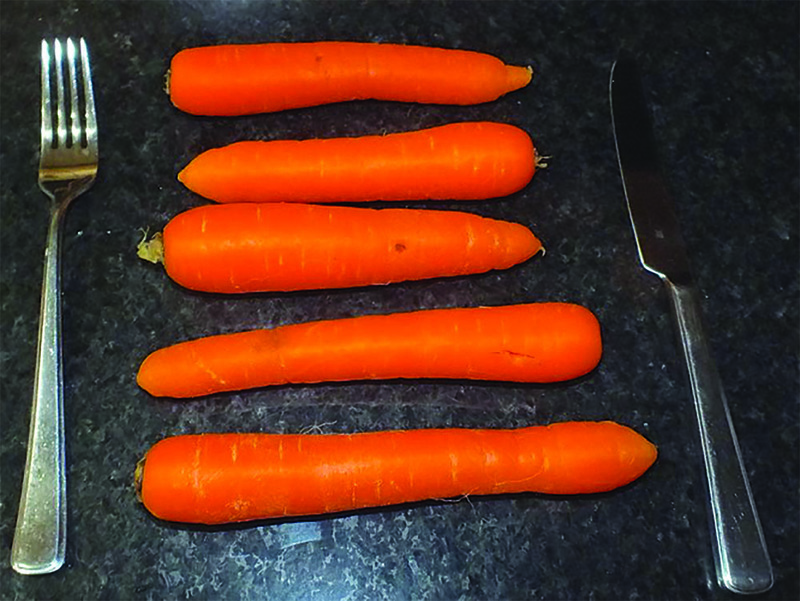 Carrots contain 0.5g oxalic acid per 100g (information from Wikipedia). Therefore, a 1lb (= 0.45kg) bag of carrots would contain 2.25g oxalic acid, or enough to treat one hive. The lethal dose for humans is 0.6g per kg (information from Wikipedia) meaning that a beekeeper weighing 165 pounds (75kg) would need to swallow 45g (enough to treat 20 hives) to have a 50% chance of dying. 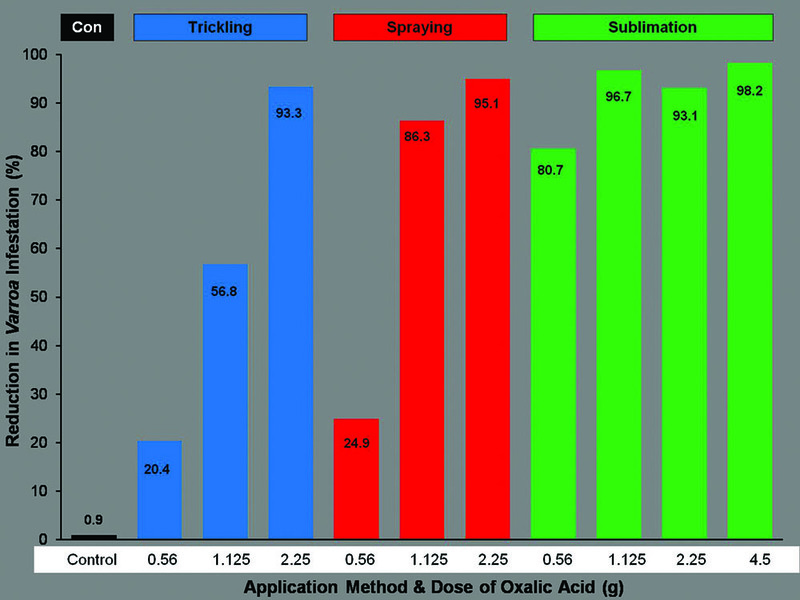 Oxalic Acid is a Natural Chemical. One pound of carrots, the amount shown, contains approximately 2.25g oxalic acid. This is enough to treat one hive. 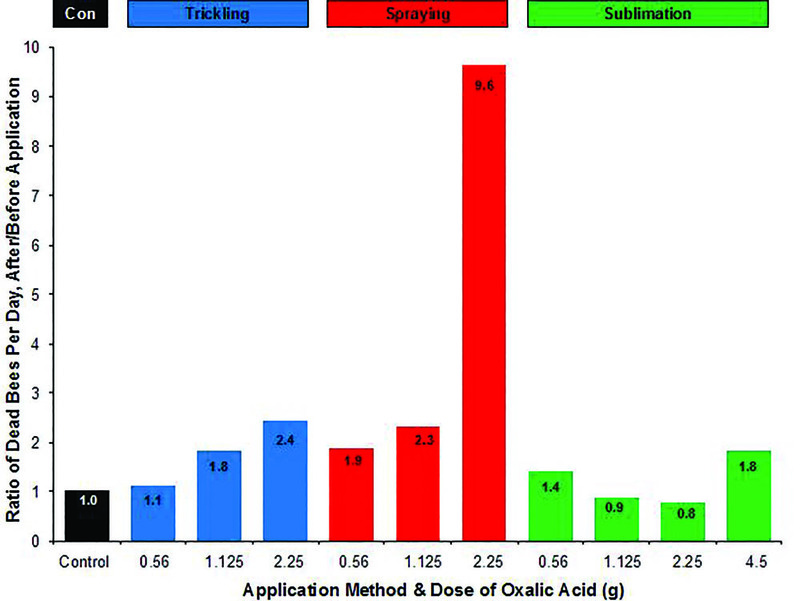 Oxalic acid is harmful to the eyes and mucous membranes. It is important not to breathe in oxalic acid, both the powder and the fumes. We found that it took only a few seconds to place the oxalic acid crystals into the applicator cup and to insert the applicator into the hive. As a result, we found that even if the applicator was already under power and hot it could be inserted into the hive before oxalic acid fumes were produced, so that all the fumes were confined to the hive. We temporarily sealed the hive entrance using pieces of foam so that the vapour was confined within the hive. It is recommended to keep the entrance sealed for up to 10-15 minutes after the applicator is removed. As we applied oxalic acid in Winter on cool days, there was no foraging activity to disrupt by temporarily closing the entrance. The administrative position of using oxalic acid to treat hives to control Varroa varies from country to country. In Britain, a registered oxalic acid product, Api-bioxal, was approved in 2015 by the Veterinary Medicines Directorate. Api-bioxal consists of oxalic acid dihydrate (88.6% by weight), plus small amounts of silica gel and glucose. The latter materials would seem not to be toxic to varroa. 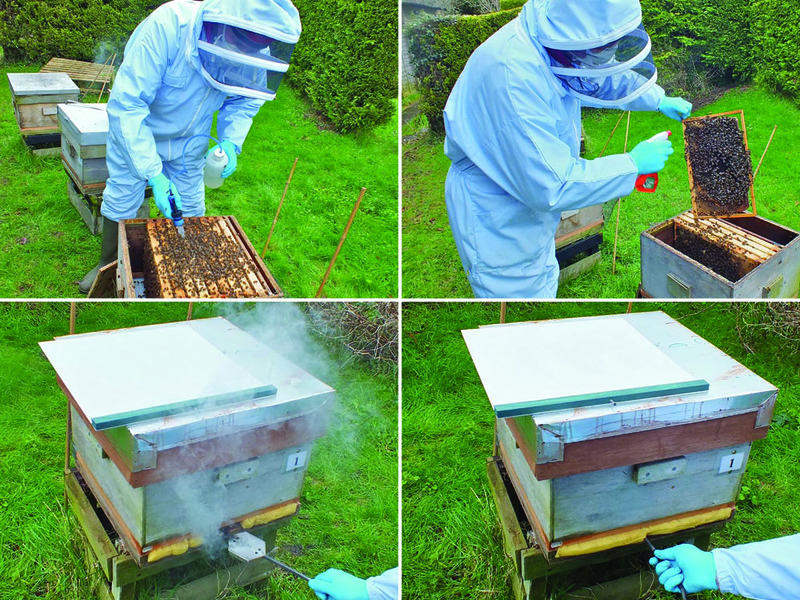 The official UK recommendation, for sublimation, is to use 2.3g to treat one hive. 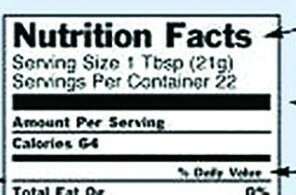 This corresponds to 2.3 x 0.886 = 2.04 g of active ingredient. Our research used almost exactly this amount. It is possible to obtain a wide variety of masks with different levels of face protection and a range of filters. Some filters that conform to the required European standard, which applies specifically to dust inhalation, also provide protection against organic chemicals and acids. If using the sublimation method, it would seem sensible to use such a dual-purpose filter in order to provide full protection during both the handling of the oxalic crystals and the sublimation. US beekeepers might test some of the masks available in the USA that conform to these standards and report back on how they compare. Because oxalic acid only kills phoretic mites, for maximum effectiveness it is necessary to treat broodless hives. By means of hive inspections in late autumn and Winter, beekeepers can determine when the natural minimum brood period occurs in their area. However, brood rearing may vary year by year. In the Winter of 2015/6 we found that brood rearing in Sussex continued longer into December than usual, and resulted in our delaying oxalic acid treatment until January and having a lower proportion of broodless hives. This was probably due to the very mild Autumn, with weather warm enough for foraging throughout December, plus prolonged flowering of ivy, the main autumn flower source, into early December. What we do is to check hives immediately or a few days before before oxalic acid application and scrape out any small patches of capped brood. Although it is extra work, it is worth doing as even small areas of capped brood will allow many adult female Varroa to escape the oxalic acid. Our results showing 97% varroa mortality apply to broodless hives. The USA is a large country with many different climates, and beekeepers in different regions may need to work out the best method and time of applying oxalic acid to broodless hives. In areas with warm winters there may be no full natural Winter break in brood rearing, and in northern and mountain areas it may be too cold in Winter to open hives. Package bees provide a very good opportunity for applying oxalic acid, as the colony will not have capped brood for approximately eight days after hiving. 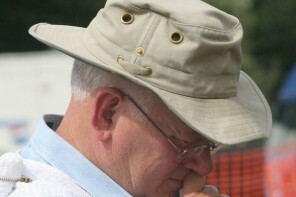 Beekeepers are practical people and can figure out suitable methods. The EPA document states that “The solution method and the vaporized applications are made in the late Fall to early Spring, when little brood is present.” But even a little brood can protect a lot of Varroa from the oxalic acid, as many Varroa will be breeding in capped cells. At LASI, we determined the amounts of capped brood in hives in different months and the proportion of Varroa in brood cells. This varies from c. 70% to 10% in brood cells, in total, with the minimum occurring in December. At LASI, we carried out a study in which we determined Varroa populations in 42 hives at an interval of one year (Al Toufailia et al. 2014). In that year, the Varroa populations increased on average by 40 times per hive, equivalent to slightly more than five doublings. This means that killing 75% of the Varroa in a colony slows the population by the equivalent of approximately two fifths of a year and killing 50% by just one fifth of a year. By contrast, killing 97% was the equivalent to the control of a year’s Varroa population growth. It is good to have results worth sharing with beekeepers, especially as the Sussex Plan for Honey Bee Health & Well Being is aimed at providing practical information. When we started our research on Varroa control we never imagined that we would be able to make such a clear and simple recommendation. That is, to have solid evidence that one application method was the best in all respects: killing Varroa, not harming the bees, resulting in stronger colonies, and in being quick and easy to apply. That method is sublimation. It is fortuitous that we are publishing our results soon after oxalic acid has been approved for use to control Varroa in both the UK and USA. Although the EPA has approved the use of oxalic acid via trickling, spraying, and sublimation, sublimation is the best. This research was funded by Rowse Honey Ltd., The Esmée Fairbairn Trust & Burt’s Bees. HAT’s PhD is funded by the University of Damascus.